The New Design of WebAppers has just released! 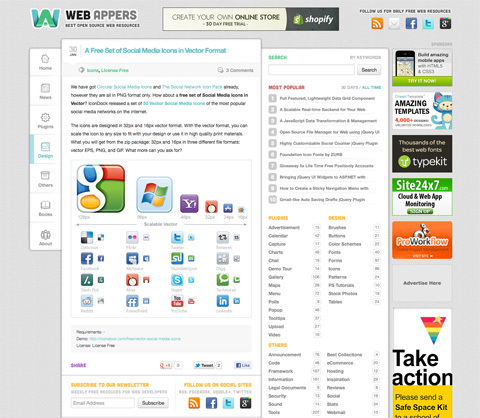 After days and nights of hard work, you can eventually check out the re-design of WebAppers. It’s a responsive design, which is crafted to use W3C CSS3 media queries, to adapt the layout to different viewing environments. So that users across a broad range of devices and browsers will have access to WebAppers, laid out so as to be easy to read and navigate with a minimum of resizing, panning and scrolling. Take a look at the following examples of viewing WebAppers in browser with different resolutions: 1280px, 1024px, 800px, 600px and 320px. I have added Popular posts section, so that you can get an idea of some of the most popular posts in the last 30 days or all time. It’s best for users have not got enough time reading every new posts daily. You will also notice the sticky navigation menu on the left hand side, it will follow you when you scroll. So that you can quickly browse other topics if needed. I have also updated the recommended books section too. You are able to check out some of the useful books for web designers and web developers. Please feel free to suggest some of other great books I have not mentioned too. It will make our life better. And finally, I have finally created a new Facebook and Twitter account for WebAppers. Please Like us on Facebook or Follow us on Twitter, and stay tuned with the daily open source resources. 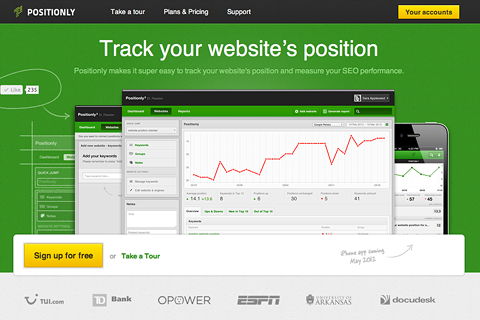 Positionly makes it super easy to track your website’s position and measure your SEO performance. You can browse detailed statistics of website position for all of your keywords. Every keyword you add to Positionly tracks its own history, position change and comments made. You can also group them for better organization. Unlike many others, Positionly is using modern web technologies wisely, so that it is supported on most of the currently available mobile platforms including, iOS and Android. You can try Positionly absolutely free for 14 days, and you do not need to provide your credit card details to start with. You can also sign up with the promo code “webappers” in order to get 10% discount off for all plans. Positionly is very kind to giveaway 5x Life time Free accounts to our readers. In order to win one of the life time free accounts, you simply need to make a tweet with any messages containing “http://positionly.com”. 5 Winners will be picked randomly on 29th April 2012. Please also stay tuned with Positionly, they are rolling out some exciting features very soon. WebAppers has been around since 2007, and I really enjoy hunting the best open source resources for web developers every single day. I always felt like WebAppers needs a new design, but I had no time to do it until a month ago. I have been busy working on the new design of WebAppers and I am pretty excited to get to this far. 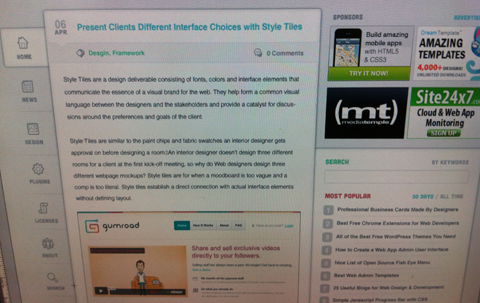 Here is a sneak peek of the new design of WebAppers. You can Follow us on Twitter and stay tuned for the new design. Thanks again for all of your support. I will keep bringing you the best free resources around the world! Thank you for all of the participants of Giveaway 3 x Annual Professional ManageWP Licenses. We are happy to announce the following winner. Congratulations. You will receive an email from ManageWP with instructions of getting the license shortly. Are you using WordPress to mange multiple blogs of your own? If so, you may find ManageWP very useful when maintaining your blogs everyday. You do not need to login to each of your WordPress sites individually anymore. ManageWP is a state-of-the-art management tool that enables users to quickly and easily Manage, Monitor, Backup, Deploy, Publish, and Secure any number of WordPress sites. ManageWP has just surpassed 100,000 managed websites recently as well. It has been designed for WordPress users by WordPress users, and ManageWP aims to be the only quintessential management dashboard that users will ever need to take back control of all their WordPress sites. You can also upgrade WordPress, plugins and themes across all of your sites with just the click of a button. In this giveaway, 3 lucky readers will get Annual Professional License worth $486 each, which is available for WordPress user with up to 25 WordPress sites. Just leave a comment below by suggesting a best new feature for ManageWP in order to win this contest. ManageWP will pick 3 readers with the best comments and announce the results on 19th March 2012. Best of luck. 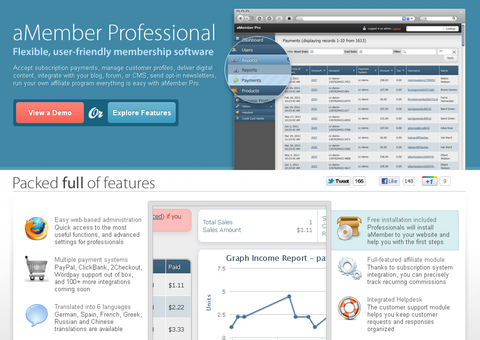 Thank you for all of the participants of Giveaway 5 x aMember Pro Membership Software. We are happy to announce the following winner. Congratulations. You will receive an email from WebAppers with instructions of getting the license shortly. 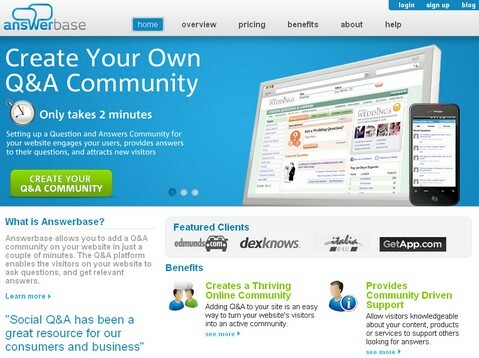 Thank you for all of the participants of Answerbase: Q&A Forum (3 Annual Licenses Giveaway). We are happy to announce the following winner. Congratulations. You will receive an email from Answerbase with instructions of getting the annual license shortly. Answerbase allows you to set up a Q&A system for your website in just a few minutes. You can easily integrate with your existing website or start a brand new online Q&A community on any subject. Users will be able to ask questions relevant to your site’s subject matter quickly and easily through your very own Q&A platform. As your visitors ask questions, other members of the community and members of your staff are able to submit quality answers. One of the features I really like about Answerbase is that active members and the answers that they submit are ranked and rated so that visitors to your site are able to easily recognize valuable content and contributors. And also, your Q&A site can be customized to reflect your design preferences, allowing you to visually integrate with your existing site. Answerbase is very kind to giveaway 3x Business Level accounts (1 full year of free service valued at $200/month each) to our readers. In order to win one of the annual licenses, you have to sign up for a free trial of the Answerbase service, and then submit your Answerbase site name to the comments under this post. Winners will be picked randomly on 7th July 2011.